Auto-Correction can be a helpful feature, but it can also be a frustrating feature. Most iPad and iPhone users have experienced typing an email or text message only to spot garbled words after the Auto-Correction feature got its hand on it. You can do some cool things with Auto-Correction. One neat keyboard shortcut is to skip typing the apostrophe in contractions like "can't" or "won't" and let Auto-Correct insert it for you. Of course, unless you type a lot of contractions, the time saved may not be worth the frustration involved. 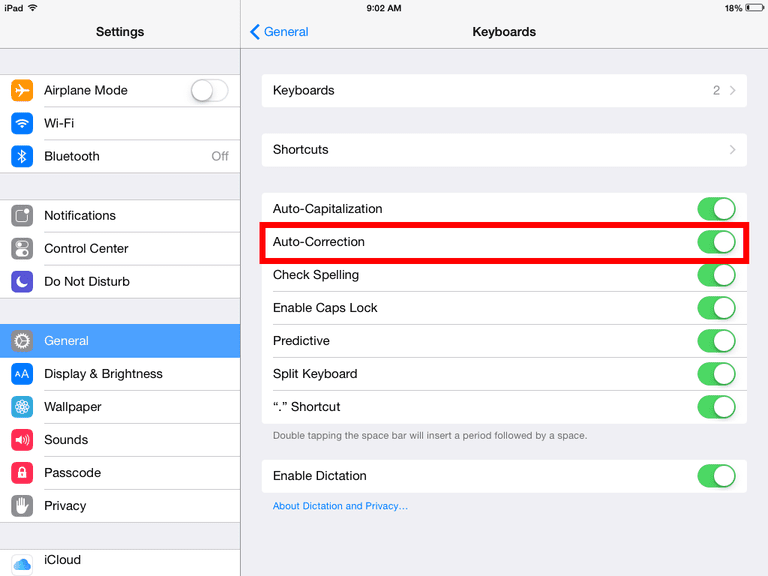 You toggle auto-correction on or off in the Settings app. Tap the Settings app on the Home screen. Choose General from the menu. Tap Keyboard to open the keyboard settings. The Auto-Correction setting is just below Auto-Capitalization. Tap the slider next to Auto-Correction to turn it on or off. If you want to have your cake and eat it too, use auto-correction without it correcting your typos as you type. By default, spell checking is turned on for your iPhone or iPad. So long as it remains on, you can tap any misspelled words to see a pop-up menu with three choices for correcting the misspelling. Tap a message and then go back through your misspelled words to change them to the correct spelling. Pay attention to predictive typing, which is also turned on by default and configured in the same keyboard settings screen. Predictive typing suggests words as you type. If you are typing a long word, keeping an eye on the predictions across the top of the keyboard allows you to use one tap to complete the word. The iPhone and iPad keyboards offer other tricks. Access the virtual trackpad on the iPad by holding two fingers down on the keyboard. This gesture turns the keys blank and allows you to move the cursor with your fingers. If your iPhone supports 3D Touch, which was introduced with the iPhone 6S, you can press a single finger down on the keyboard to activate the virtual trackpad. Numbers and special characters show above the letters on the keyboard on an iPad. Activate these alternate numbers and characters by tapping the key and sliding your fingers slightly down. Voice Dictation is the ultimate shortcut. Just tap the microphone key and let your voice do the typing, courtesy of Siri. To insert a comma or period, while you dictate, say the word "comma" or "period."